Deaths of new mothers are on the rise in the U.S.
SPRINGFIELD — Deaths among pregnant and recently pregnant women have been on the rise in the U.S. for more than a decade, and a group of state lawmakers has introduced legislation aimed at reversing this trend in Illinois. According to a report from the Illinois Department of Public Health, an average of 73 women in Illinois died each year from 2008 to 2016 within one year of pregnancy, 72 percent of those deaths were preventable, and 93 percent of violent pregnancy-associated deaths were preventable. Per the report, African-American women were six times more likely to die of a pregnancy-related condition during that span. 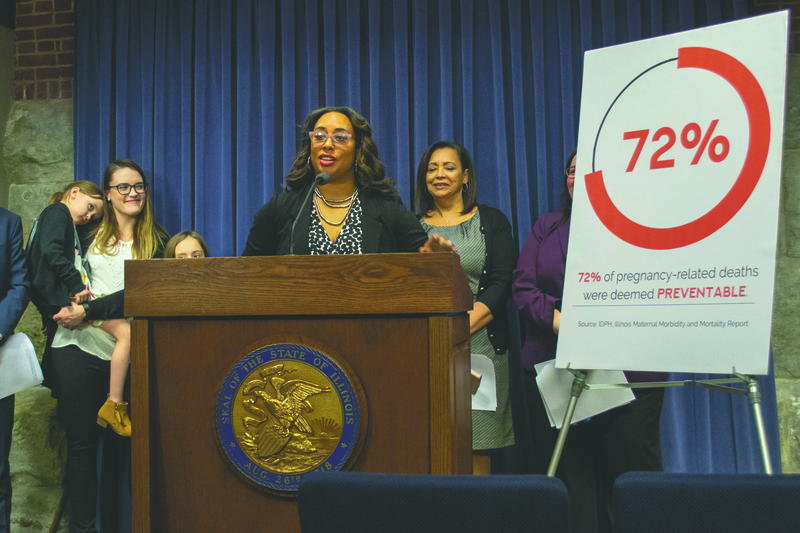 “For African-American women in particular, we’re dying at six times the rate amongst American women, which means we’re dying at Third-World country rates,” state Sen. Toi Hutchinson (D-Olympia Fields) said. Hutchinson and Castro have introduced reforms focused on these issues, including Senate Bill 1909, which would continue Medicaid coverage for new mothers for 12 months after giving birth – currently a mother is covered for only 60 days after a birth. 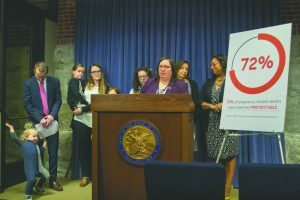 That bill would also create a pilot program to provide voluntary in-home nursing visits to low-income, first-time pregnant women; mandate quality control guidelines and hemorrhage protocols for birthing facilities; and require insurance plans to cover medically necessary treatment for postpartum complications. Hutchinson’s Senate Bill 132 would require continuing education programs to teach doctors and nurses about implicit bias that can affect behaviors, decisions and actions in the treatment of women and minority groups. Hutchinson said the type of care provided often depends on “how people view each other” during those interactions. “There’s very few other things you could say in the highly industrialized nation that we live in, one of the richest countries on Earth, where these rates are the only places where they’re going up,” she said. State Sen. Iris Martinez, a Chicago Democrat, said she would be exploring legislation focusing on making home births safer for those who either choose not to give birth at a hospital or do not have access to one. Her Senate Joint Resolution 14, which passed in the Senate March 13, would create a home birth crisis committee to provide the General Assembly with evidence-based solutions to the Illinois home birth maternity care crisis. 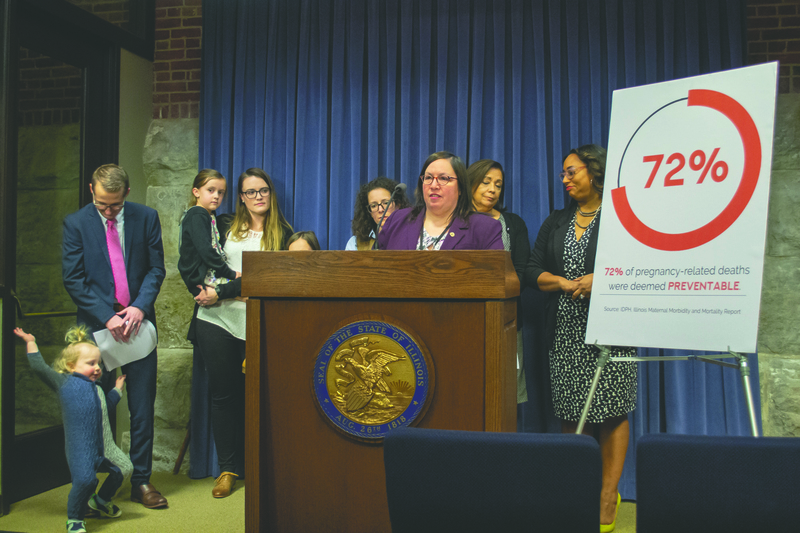 Martinez said state home births increased by 50 percent from 2007 to 2014, but there are now fewer than 10 legally recognized home birth nurse midwifes in Illinois. Martinez said 33 states license community midwives, and Illinois should join them, as many women cannot afford to have a baby in a hospital.